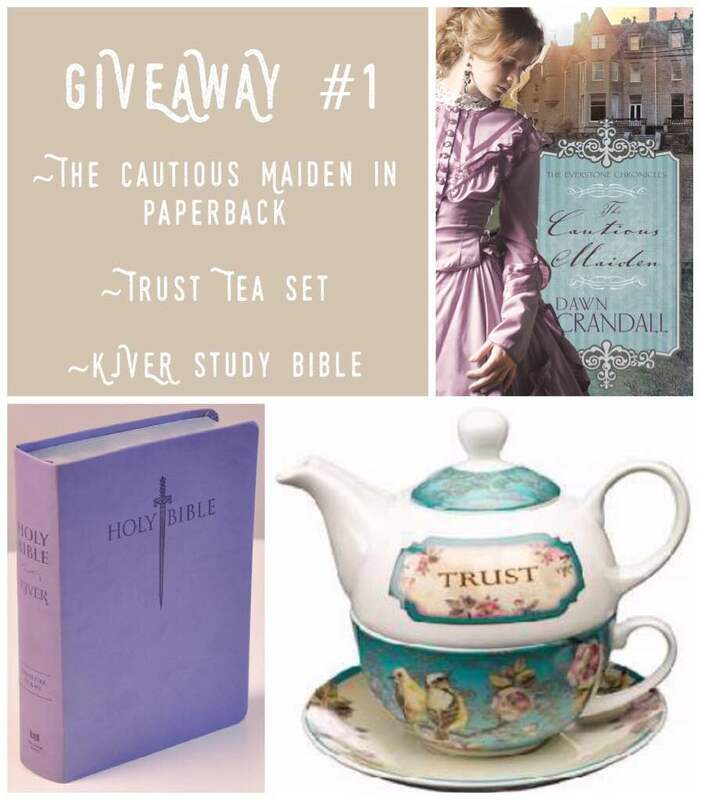 I am honored to be a part of the blog tour for The Cautious Maiden by Dawn Crandall. Details about an awesome giveaway are at the bottom of this post. Thank you to Dawn for the eARC of The Cautious Maiden! I read this book in June 2016 in exchange for an honest review. All opinions are entirely my own. This novel is the fourth book in the amazing Everstone Chronicles. When I had this series recommended to me earlier this year, I immediately fell in love with the beautiful stories and characters. I can’t recommend them highly enough! As I told my friend Carrie (who introduced me to this series), I was dying over every moment from the first page of The Cautious Maiden. I decided before I even started reading it that I would love it. And I absolutely did. I am a picky romance reader. I always hope I know how they will end. I want the hero to fall in love with the heroine and live happily ever after. I want there to be beautiful kisses and romantic moments. But I want it to be clean and uplifting too. I want romances to teach me something not just give me a million kisses. Dawn does all of this and more. She is incredible at creating stories that surprise, shock, and satisfy me. The Cautious Maiden is a lovely story and a beautiful romance. How does this series keep getting better? Seriously! I find myself cheering for every protagonist and every love story. I love how different this book is from the previous books. All the characters in the Everstone Chronicles have their trials and have made mistakes, but the difficulties and past mistakes that Violet and Vance must overcome are on a grander scale which makes their redemption all the sweeter. Oh boy, can Dawn write a beautiful kiss or what? Seriously, swooning over every one! The Cautious Maiden by Dawn Crandall follows the story of Violet Hawthorne, whom we first met in The Captive Imposter as the receptionist at the front desk of Everston. At the start of this novel, Violet’s reputation is compromised in several ways by her brother–the illusive Ezra Hawthorne. He cuts off her beautiful hair and has lost her in a poker game to the evil Rowen Steele. Surprisingly, it is the reforming Vance Everstone who comes to her rescue in both situations, including proposing to Violet to save their mutual reputations. Violet goes with Vance to his family’s home in Boston and they begin to plan their wedding and future together. But Violet always thought she would marry for love. And Vance has never been in love. While they find themselves becoming more attracted to one another, Rowen Steele is sighted in Boston and Vance’s past keeps hindering their relationship. Can they truly be happy and even fall in love? Violet is a unique heroine in the Everstone Chronicles because she is not brought up in high society or an heiress to a large fortune. She is a gentleman’s daughter but now works at the Everston hotel. I think that makes her more relatable and more likable. I wanted her to find happiness because of all the hard things she’s had to go through. From her parents both dying to her brother’s shady lifestyle, Violet has lost a lot. And perhaps it is because all those losses were fairly recent that it feels like she has nothing and no one to support her. And yet, she holds fast to her faith and works towards her dreams. I love that Violet overcomes her trials and seeks a better life for herself. But also that she is nervous about fitting in and wants to make a good impression. She is a very real character. Vance is potentially my favorite hero of the series. (Ok, that is really hard to decide because now I am thinking of how sweet Nathan is to Amaryllis or how devoted Lawry has always been to Meredyth or how protective Dexter is of Estella. That’s it. I give up. Impossible to pick a favorite when they are all so dreamy!) What I love most about Vance is his incredible journey to find redemption and true love. He is a beautiful example of how someone can change. And what a romantic he is! I love the way he fights to be pure and true to Violet and how he falls in love with her. It’s just so beautiful! Violet and Vance’s love story is genuine, passionate, and beautiful. They want to be better for each other. They tell each other about their deepest dreams and their worst mistakes. They fight about silly and about important things. They talk and get to know one another. And best of all, they fall in love. I really loved seeing Vance become a true gentleman when he is with Violet. I could tell early in the story that he was falling in love with her just by how he treated her. I also love that they both work to be honest with each other–at least they try to tell the truth. I appreciate how their relationship develops from friendship to a passionate romance. A few of my favorite romantic quotes are a must here. I especially love anything Vance says that is about love. Can you blame me? As with the other novels in the series, this book is full of action. From the first page, we have unexpected events ranging from apparently scandelous to terrifyingly dark. We are constantly on a roller coaster of emotions in this book. Will Rowen Steele show up? Is Vance in love with Violet? Will they kiss? Will they actually get married? So many questions and emotions. And I loved it. I reread a good portion of the book a second time just to experience the action (especially the romance) again. I don’t understand all the twists like why exactly Ezra cut Violet’s hair off. But I am impressed by all Dawn includes in a 300 page novel with it all feeling cohesive. I love the theme of redemption that runs through this novel. Certainly, Vance is the obviously character in need of and seeking redemption from his past. I love that he has made Christ a central part of his life. But I also love that Violet also has to learn how to find redemption through Christ. While her sins are quite a bit less intense than Vance’s, she still isn’t perfect. And she learns to ask for forgiveness and to judge others less. I think those are great morals for readers as well. One of my favorite quotes from the novel is about purity and self control which ties in well with this idea of redemption. And I totally agree with it. This book met all my rather high expectations as Dawn creates yet another beautiful, moving, and action-packed romance in Gilded Age America. Overall, I cannot recommend this book and the full series highly enough! These books have quickly become some of my favorites. They are beautifully written, include unforgettable romance, and boost intelligent and intriguing characters. Check out my reviews of The Hesitant Heiress, The Bound Heart, and The Captive Imposter. More importantly, read this incredible series for yourself. 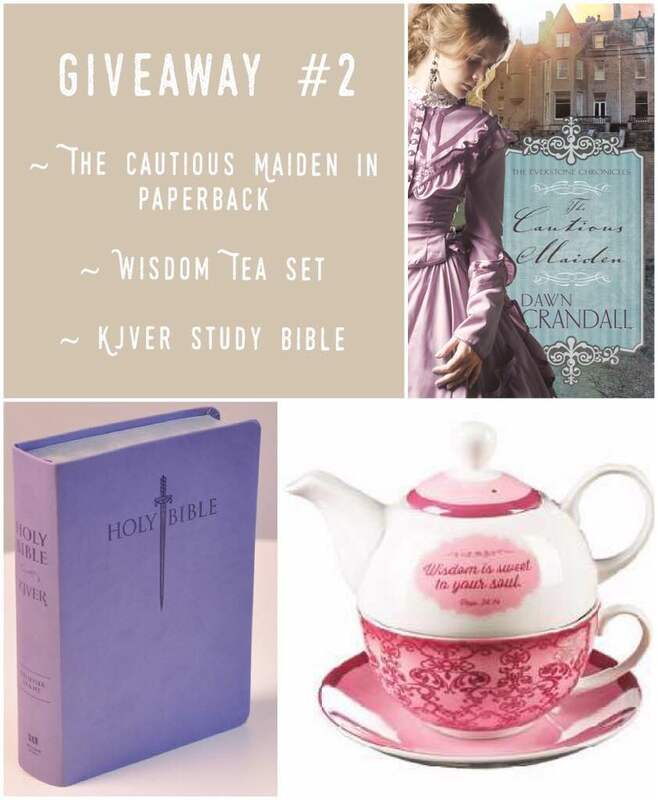 There are two giveaways happening with the release of The Cautious Maiden. Thanks so much, Carrie! Haha, I’m glad you shoved them at me 🙂 Now if only I could pick a favorite in the series. It’s impossible! Haha. Thank you for reading! i know … they’re all SO GOOD!! !